An infinite and unfathomable dedication to his spiritual master and the previous acharyas, and an unending compassion for the conditioned souls adorn the truly astonishing character of this genuinely humble and fully Krishna conscious spiritual leader. These are the very qualities that make Srila Jayapataka Swami what he is today, a pure and unalloyed devotee of Lord Krishna. 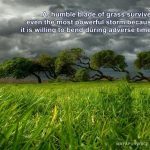 Today, when deceitfulness and hypocrisy have become the way of life for the majority of the population, when humility is considered weakness and simplicity is looked upon as illiteracy, when selfishness is hailed as smartness and compassion is laughed at as sentimentalism, meeting a person who is unquestionably honest, unpretentiously humble, spontaneously compassionate and spotlessly simple at heart, yet impressively sophisticated, fiercely dynamic, awfully uncompromising and extraordinarily skillful, is bound to be an absolute surprise. 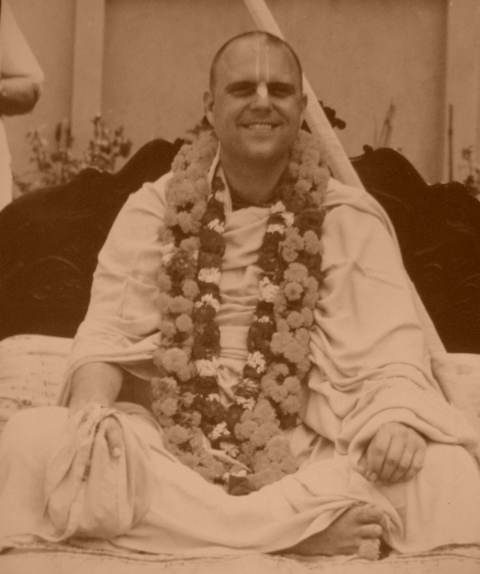 Meet His Holiness Jayapataka Swami, a direct disciple of His Divine Grace A.C. Bhaktivedanta Swami Prabhupada, the founder-acharya of the International Society for Krishna Consciousness. A senior member of ISKCON’s Governing Body Commission, Srila Jayapataka Swami is the senior most sannyasi in ISKCON today. Srila Prabhupada personally made him the lifetime chairman of the Bhaktivedanta Swami Charity Trust. He has also been the vice president of the World Hindu Federation. 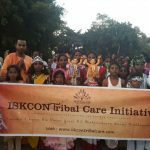 With nearly 50,000 diksha disciples and thousands of siksha disciples from around the world, Srila Jayapataka Swami has a massive popularity, not only in ISKCON and other Gaudiya organizations, but also in the other Vaishnava sects, like the Shri Vaishnavas and the Madhvas. At number of occasions prominent acharyas of reputed Indian temples have showered praise on him for his service to the Sanatana dharma. His public esteem does not stop there. Many eminent personalities from all walks of life take pleasure in associating with him. The same goes with general populace, the wealthy as well as economically challenged, who consider themselves fortunate even if they happen to get a chance to see him. I have personally seen this happen. What makes Srila Jayapataka Swami so special? What in him attracts whoever meets him? What makes him the most popular Gaudiya Vaishnava guru physically present on the planet today? And yes, I wouldn’t shy away from one more question- what in him makes some unfortunate people jealous of him? Let me be honest- I cannot even outline His Holiness Jayapataka Swami’s glories in this short write up. Actually no one who knows him possibly can. It will take volumes of books to befittingly glorify this pure representative of Lord Sri Krishna Chaitanya Mahaparabhu. 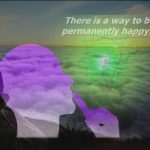 The reason I ventured into writing about him here is, I am concerned that millions of people are missing out something extraordinary in their life if they don’t take advantage of learning from this exemplary spiritual preceptor. I do not want people to lament in the future that they missed the opportunity because they did not know him. Lord Chaitanya taught His followers how to teach. He did it by His own example. Getting inspired by words is one thing; getting inspired by someone’s action is entirely another. Inspiration received by hearing someone who does not live his words does not last, no matter how appealing it may feel in the beginning. This is where Jayapataka Swami takes the lead. You see him consistently following what he preaches. I have seen him and lived around him, very closely, for nearly 30 years, and I can confidently say that this person is not from this world. This is by no means an expression of mere sentiment or reverence. There are others, his contemporaries, his god-brothers and god-sisters, who also have the same view. Despite the fact that there are people who perceive him differently and may have their own justifications to do so, to me, not only as a disciple, but also as an observer who prefers to be extremely careful before endorsing a person as saintly, he is undoubtedly a saint of the highest order, sent by Lord Chaitanya to reclaim the fallen souls on His behalf and bring them back to their eternal home, the world of unfathomable eternity, pure knowledge and transcendental bliss. A curious child born in an affluent American family in 1949, renounced worldly comforts and dedicated his life to the Hare Krishna movement in 1968. 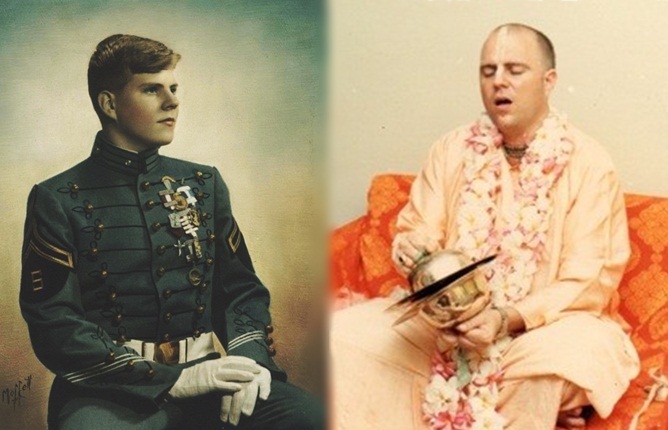 Gordon John Erdman, an exceptionally handsome and strong built young man became Jayapataka das brahmachari. 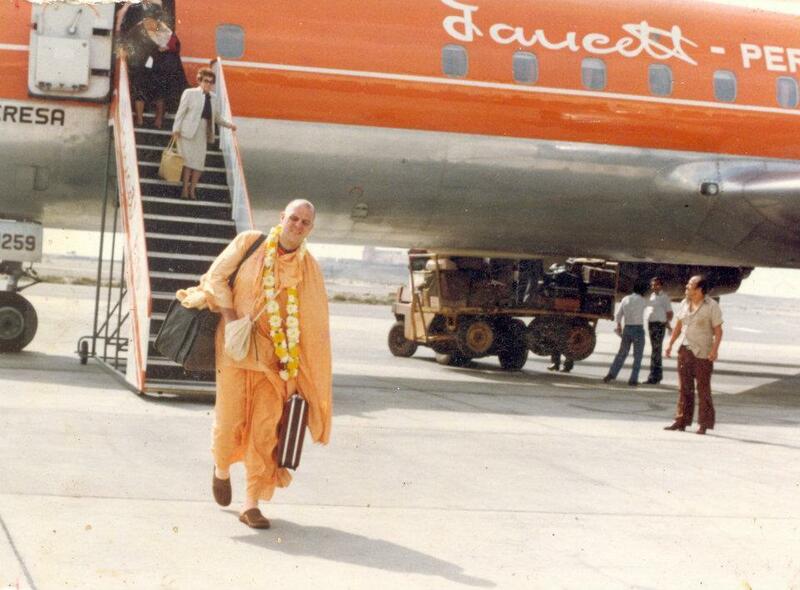 In 1970 he was awarded sannyas initiation and given the name Jayapataka Swami. 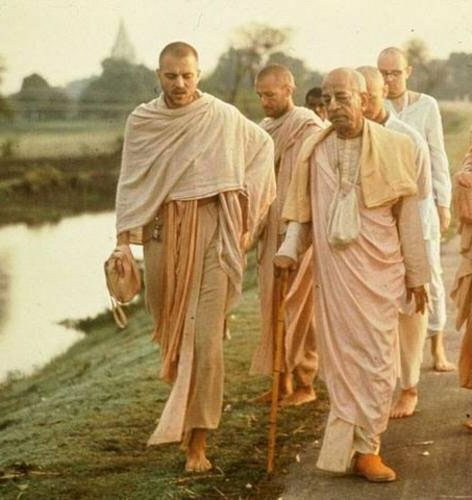 His spiritual master, His Divine Grace A.C. Bhaktivedanta Swami Prabhupada, a perfect representative of Lord Krishna, ordered him to give up US citizenship and become an Indian. Reason? The spiritual master explained: this boy had taken birth in India when Lord Chaitanya appeared before 500 years and was one of His associates. He added that this boy will preach in India and spread the message of Lord Sri Chaitanya. He inspired when he was 19. He inspires when he is 69. Indeed, it wouldn’t be an overstatement to say that Jayapataka Swami is an embodiment of endless inspiration. As mentioned, he inspires by personal example. 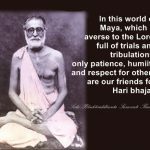 That is what makes him the guru of nearly 50,000 initiated, or diksha disciples with an unknown number of spiritual seekers waiting to be blessed by him. There are thousands others who take siksha from him making him the most popular guru today in the disciplic succession of Lord Sri Chaitanya Mahaprabhu, technically known as the brahma-madhava-gaudiya vaishnava sampradaya. A staunch follower of his spiritual master, Srila Jayapataka Swami is an icon of unwavering determination. In order to fulfill the orders of Srila Prabhupada, and to realize the prophecy of Lord Sri Chaitanya Mahaprabhu, who said that in every corner of the world and in every town and village on the Earth, His holy name will be spread, Jayapataka Swami took up the challenge of traveling extensively in all corners of the world, against all odds. In last 50 years of an untiring preaching spree, Jayapataka Swami has traversed around the globe back and forth for roughly 100+ times. In doing so, he has flown more than a million nautical miles, crossed tens of thousands of miles by road, and walked and danced through hundreds of miles in major cities, towns and villages of the world. So intense was his itinerary that practically every new trip he had to change the travelling secretary, as no single person could cope with his ultra hectic travel schedule. The one thing that cannot go unnoticed is, wherever Jayapataka Maharaj goes he attracts massive crowds. These are not paid rallies of political leaders nor are they coming to watch a football match nor for one of those well advertised mundane performances. Sometimes with great difficulties these people come to associate with him, to hear from him, to get a pure spiritual glance from him, or, at least, to see him, even from a distance. I have personally heard unknown people talking among themselves how fortunate and blessed they felt just by having a glimpse of him. Srila Jayapataka Maharaj’s contribution to the initial days and to the present-day ISKCON is enormous. 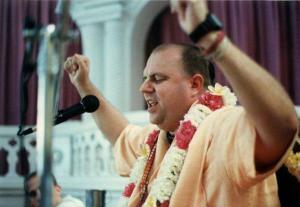 He is a proven upholder of Gaudiya Vaishnava siddhanta and a protector of ISKCON in many different ways. It would take few more pages to narrate all of it. He has written number of books on Vaishnava philosophy elucidating the teachings of the previous Vaishnava acharyas and narrating pastimes of Lord Chaitanya and His eternal associates. Readers can visit this link to get more detail. Wikipedia talks about him here. His contribution to the world at large cannot be overstated either. Through Namahatta and Bhakti-vriksha programs he is steadily transforming the world. Through these programs, millions around the world have learnt a practical way of living happily in Krishna consciousness. Sri Navadvipa Mandal parikrama is another powerful and enlightening program that HH Jayapataka Maharaj has been coordinating since 1972 and engaging thousands of people in serving the holy dham every year. This is the very program Srila Bhaktivinod Thakur described as the activity which can save the whole world. Srila Prabhupada took pleasure in calling his “Jaya pataka” his victory flag. This is very significant. A spiritual master of his towering caliber would not use such words without purpose. Jayapataka Swami has indeed lived up to Srila Prabhupada’s expectations and continues to be his victory flag even today. No surprise Srila Prabhupada entrusted to him ISKCON’s most ambitious, flagship project at Sri Mayapur when he said, “I have given you the kingdom of God. Now develop it”. Besides many other achievements, today’s thriving Vaishnava community in and around ISKCON Sri Mayapur along with the most magnificent Temple of Vedic Planetarium (being built) offer the world a definite hint at what and who Jayapataka Swami is, and what makes him the “Gentle Giant”, as one of his god-brothers lovingly called him to characterize his illustrious personality using minimum words. Lord Krishna often uses His pure devotees to set examples in the material world. Pandavas’ life, struggle and eventual victory in the battle against irreligion is one such example from the past. Srila Prabhupada’s struggle to establish the worldwide society for Krishna consciousness is a recent example. Lord Krishna’s plan for Srila Jayapataka Swami was completely unknown to the world until he got a deadly brain stroke in October 2008. For ISKCON, as if the world had come to a halt. He collapsed and went into a frightening slumber for few days. Doctors gave up but the “victory flag” of Srila Prabhupada didn’t give up. He fought with death. He fought valiantly. By his Himalayan will-power, prayers of devotees and the ultimate sweet will of Lord Krishna, he emerged victorious. 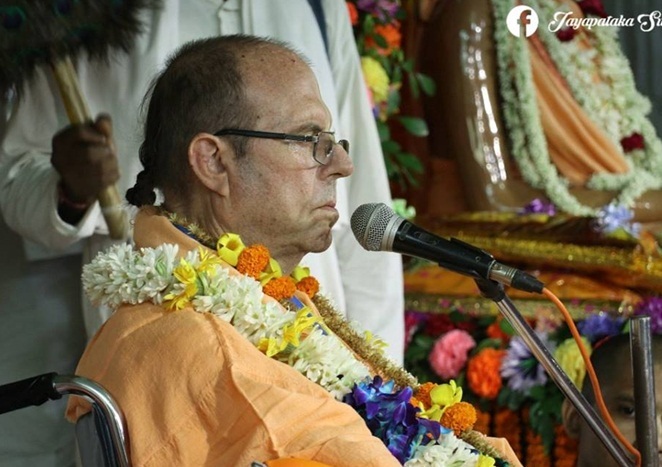 He returned to Sri Mayapur amidst the cheers and loud chanting and dancing of thousands of devotees. But after this, His Holiness Jayapataka maharaj lost the ability to walk on his own. The right side of his body became extremely weak. Despite this, he returned to the preaching field and continues to inspire. He lived for others’ benefit when he was at the peak of his health. He lives for others’ benefit when he has lost his health. This is a quality of maha bhagavat vaishnavas. By the example of Jayapataka maharaj, Lord Krishna showed the world how His pure devotees can face extreme physical difficulties but still not give up serving the Lord and His mission. We do not know what more is in store. Lately his body has developed more complications and hospital doctors are in the process of working out the best possible solution for him. Our most sincere prayers for his good health. 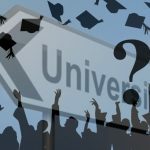 Next articleWho cheated? Facebook, Cambridge Analytica, or the Politicians?